Here is a look at what I did accomplish at the retreat. First is the rail fence top that I got put together. It used up a lot of my 1.5" strips and pieces. What is left is mostly longer strips so there might be another log cabin in my future. I put together the 4-patch blocks I need to get sent to my swap partners. The fabric all came from one of my scrap drawers. 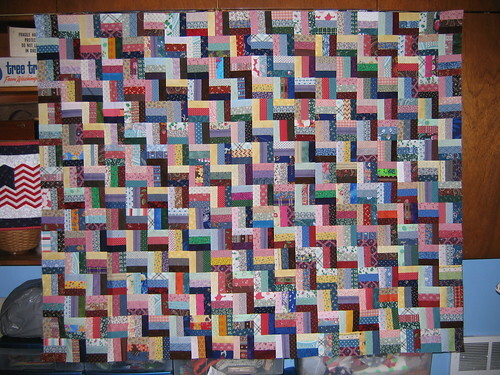 I only used the scraps that were 2.75-3" wide and I managed enough for 30 blocks! 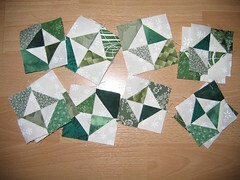 These next two blocks are going along with the center block for my Spring Fling Round Robin 3 quilt. 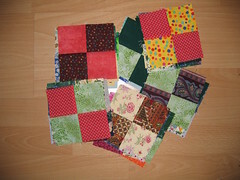 Swap Mama Margaret will be collecting all the center blocks and sending them out to the first border maker and so asked for 2 12.5" blocks appropriate for Project Linus quilts in exchange for the postage. I have become 'notorious' at these retreats for using small scraps so a couple of people gave me the triangles they cut off from their projects. I turned them into Broken Dishes blocks. I have some ideas for using these either in individual projects or with other Broken Dishes blocks I create from various projects. 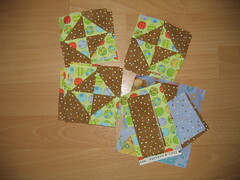 I am thinking the ones on the left might become a doll or baby quilt. 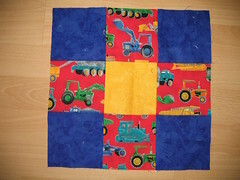 My last project is going to be a doll quilt/wall hanging. I had the little yellow and green HST in a box at home along with more of those two fabrics and the dark green and white on white so I threw them in with my other retreat projects. 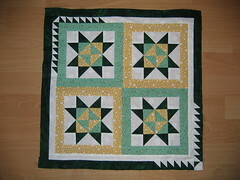 The little triangles in the border were the leftover triangles from making the flying geese units for the stars. I plan to add another white border yet but I ran out of the white on white so I had to wait to get home. Tomorrow, pictures of the mail that was waiting for me when I got home and that has come since! That rail fence is so pretty! Thank you both! 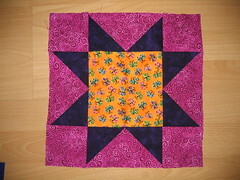 I am looking forward to getting a chance to add a border and get it finished up.